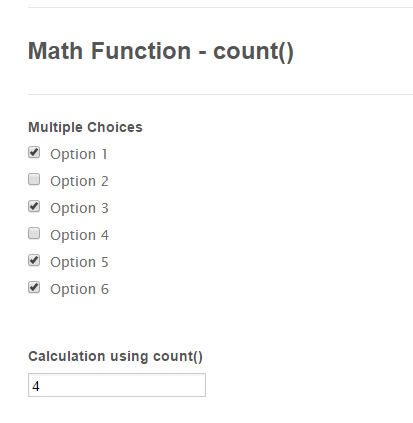 The Calculation Wizard's MATH FUNCTIONS allow you to perform mathematical tasks. 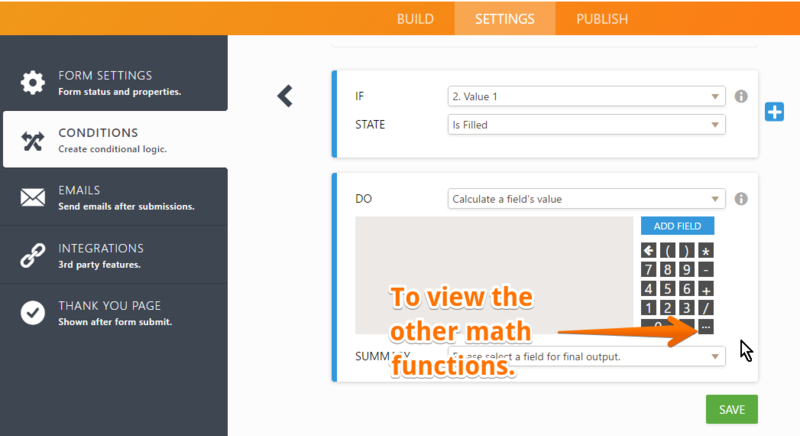 The following advanced mathematical functions are available on the FORM CALCULATION WIDGET and when using the UPDATE / CALCULATE FIELD condition. 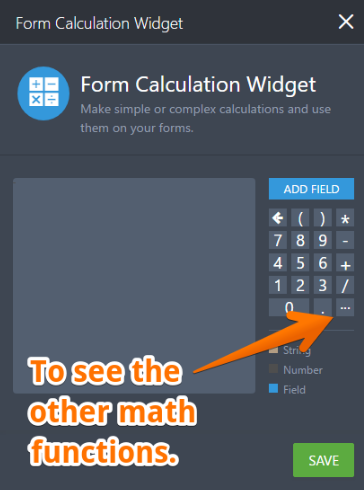 You can use this as your reference to build perfect calculation forms. 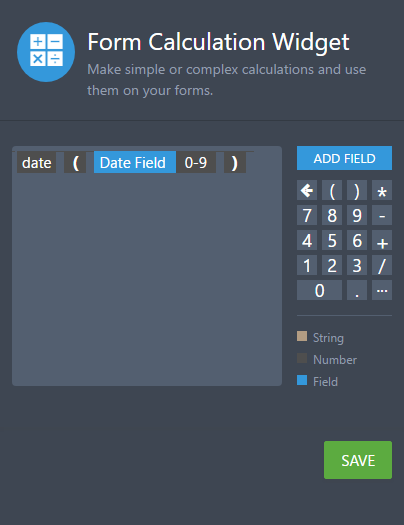 TIP: The numbers on the formula below can be replaced with the fields from your form as seen on the actual form when you test it. 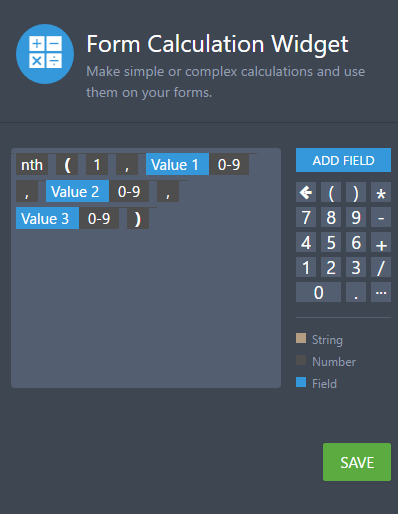 In other words, the numbers can either be defined on the formula or taken from the user input by adding your form fields. This returns the absolute value of a number. Calculates the arccosine of a number. Calculates the arcsine of a number. Calculates the arctangent of a number. This function calculates the arctangent of the quotient of its arguments. Round up a number to its nearest integer. If the value is a full number, it will not be rounded. This returns the cosine of a number. This function returns the value of Ex, where E is Euler's number (approximately 2.7183) and x is the specified number. This is opposite of the ceil() function. This rounds down a number to its nearest integer. Output the number with the highest value. Output the number with the lowest value. Power returns the value of x to the power of y. Example pow(2,3) means 2*2*2, which returns 8. Return the sine of a number. Output the square root of a number. Base-10 logarithm of E, approximately 0.434. Return the square root of 2, approximately 1.414. Returns the average value of the list of numeric values. 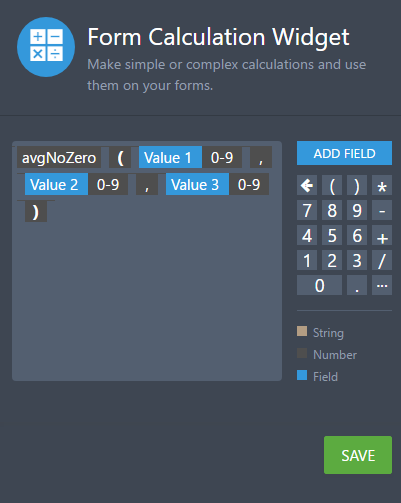 You can find the example avg() function here: https://www.jotform.com/70991655420964. Calculate average value while excluding empty fields. 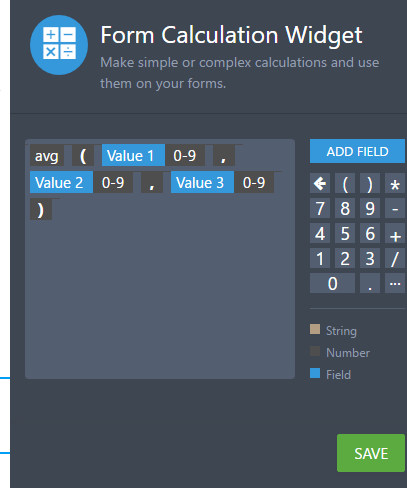 You can test this function on my cloned form here: https://www.jotform.com/70991655420964. Look for the avgNoZero() heading. Returns the number of rows that matches a specified criteria. This is usually used if you want to count the number of selections in a check box field. You can test this on my cloned form here: https://www.jotform.com/70991655420964. Look for the count() function heading. Include comma separators in large numbers. You can test this on my cloned form here: https://www.jotform.com/70991655420964. 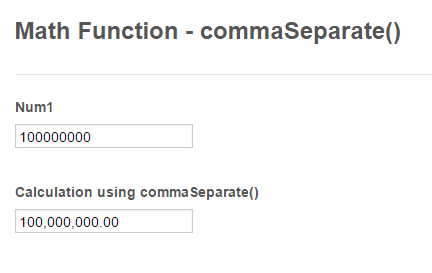 Look for the commaSeparate() function heading. Returns the sequential serial number that represents a particular date. 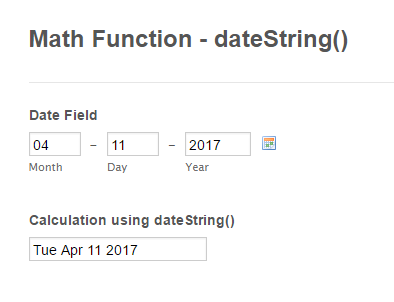 You'll need to use the default date picker field if you will be using date based functions. You can see this in action on my form here: https://www.jotform.com/70991655420964. 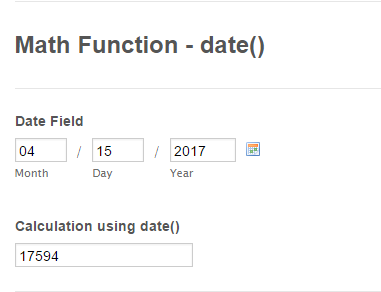 Find the math function with header date() on it. Converts the DateTime value to a date string. You can see this in action on my cloned form here: https://www.jotform.com/70991655420964. 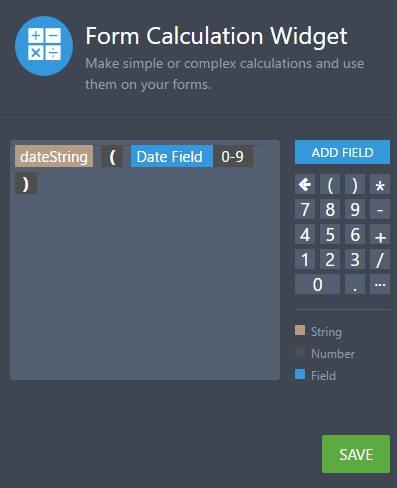 Find the dateString() function heading. The function will get the nth biggest field. On my settings and example, the first parameter is the nth biggest rule. In my case, I set it to "1", which means I'll get the 1st biggest value in the list of inputs I will set. 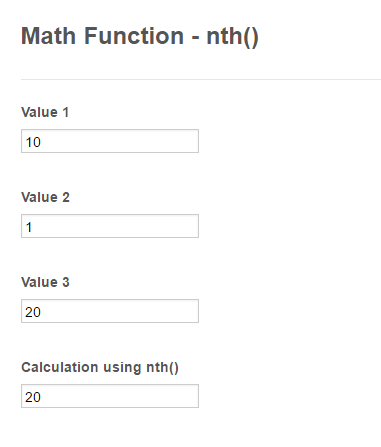 You can see below I have 3 input boxes, the nth() function will get the 1st biggest value. If you want to get the 2nd highest or biggest value, then set the nth rule to 2. You can test this on my cloned form here: https://www.jotform.com/70991655420964. Look for the nth() function heading. 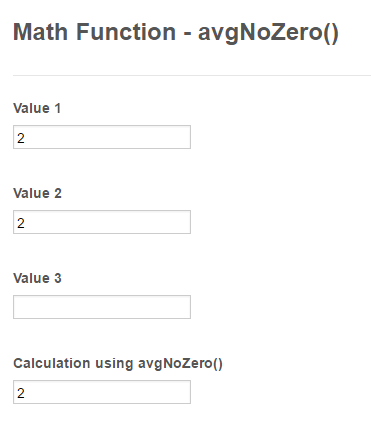 More math function references - How to turn negative values to zero? How to calculate uploaded files count and use it in Form Calculation? How do you produce the 'comma' separator between field names, for use with functions like MAX()? 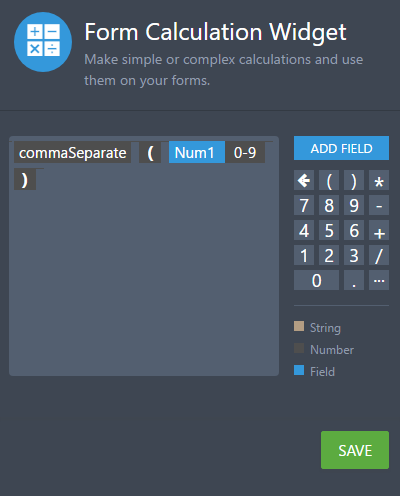 Whenever I type a comma using my keyboard, it appears both in the Form Calculation Widget editor and on the form itself as 'text'. Whereas the example of MAX() shown on this page seems to require a special 'comma' character that I do not see on the Widget's virtual keypad! I have an input table that I have each field set to Numerical Text Fields. I have the calculation per row working but what I want is if the user inputs "-" (minus operator) before the value that it auto subtracts that instead of add? 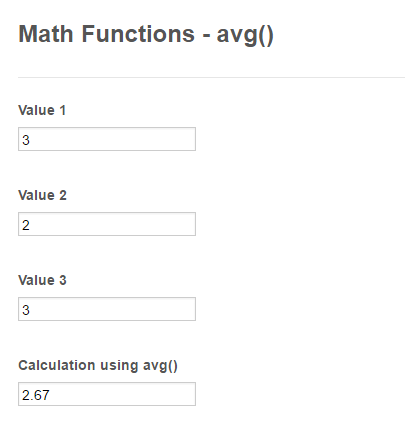 example: +/- value +/- value = +/- total. Is there a roundup calculation? The last row will also auto calculate the Per diem amount added from sub total. Tenho um formulário com 3 datas para as pessoas seleccionarem uma. gostaria de saber se é possível colocar o número de pessoas que já escolheram cada uma das datas. Hi, I am having difficulty with the form calculation for a satisfaction survey where V. Satisfied=4, Satisfied=3, Neutral=0, Dissatisfied=2 and V. Dissatisfied=1. Also, what would be the best way to display this data (i.e., pie, chart, etc) I'd like to see the number of responses for each question. how can i do (fieldA+fieldB) times the number of fields added? so if there was three A,B,C it would be (fieldA+fieldB+fieldC)3 cause there are three fields? I'm using the Configurable List widget to allow a user to add different booking dates for a room. It simply displays the date to select, then the user clicks the + button to add another date and so on. What I then need to do is to count the number of dates added and multiply that by another field (the cost of a room) to give a total cost. What I cannot figure out is how to add up the number of dates entered by the user (ie if he has entered 5 different dates then I need to use the figure 5 to calculate the total cost). Is it possible to give an error if the calculation total is less than 6 or greater than 20? how can add percentage in a certain amount that will be filled? Is there option to make something like 0.137 round to 0.1 and 0.987 round to 0.9? Id like to add up the values inserted in 3x fields and display it in a forth for each row of a matrix grid. Im basically creating a stat sheet which i can embed to my basketball club's website to allow team admin members to enter stats of their game scoresheets. We need to find the total number of hours and minutes between start time and end time. What would the calculation look like for this? I need to round up to the nearest $0.25; but the Ceiling function only allows me to round up to the nearest whole number. How can I do this? Can I calculate the days between two dates? Can you do if statements? How to add interest to calculate? Can you show how to use this to generate a unique number for every submission? I want to have a quote form that gives users a reference they can use for self-quoting. If you have multiple check boxes, how do you assign a unique value to each item in the check box. For example, say you have red, blue, and yellow as check box options. How then do you assign a unique value to each color, so that when a person clicks on the color, its associated value is added to the calculation. In Excel, this would be done with an IF,THEN function. Is there a way that on the final output or answer to the math calculation that I can have it show the dollar sign and decimal point? 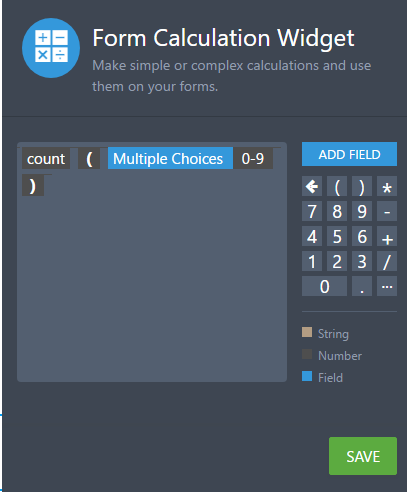 How can I set a calculation for my application form? Run time constants. Feature request or bug report?